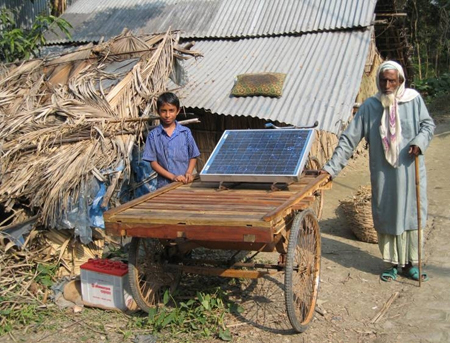 Dr Sam Wong, from the University’s School of Environmental Sciences, took this photograph of a family collecting a solar panel for their home in rural Bangladesh, as part of his research into sustainable development projects in some of the poorest areas of the world. Dr Wong has spent time working with villagers in Bangladesh, India and Ghana to understand what made projects focused on solar energy and water management work, and what factors contributed to their failure amongst poorer communities. He is particularly interested in the role that the World Bank plays in promoting renewable energy in developing countries. Dr Wong is analysing its policies and underlying framework to understand how effective its energy interventions are. His work on solar lighting in Bangladesh and solar lanterns in India has highlighted the need to look beyond economic factors and pay more attention to the social norms that shape people’s energy needs in poorer communities. Dr Wong said: “I am particularly interested in examining whether poor people really benefit from development projects. My role is to help donors and project managers understand local situations and improve living conditions. “A project I looked at in India, for example, saw a solar cooking system installed in a monastery, where it heated bean soup ready for 100 worshippers within 15 minutes. The high installation costs, however, have raised concerns with many charities in India. Research highlighting how the long-term economic, social, and health benefits outweigh the immediate costs, is essential to get local authorities and charities to support sustainability projects. Hi Stephen, you are right; we need to take health into account, especially it’s one of the key components in the Millennium Devt Goals. I have done some work on ‘energy-land-water’ nexus, but adding ‘health’ into the nexus will offer a more complex picture. Stephen, does your research touch on health? if so, i wonder if you want to work with me in an attempt to explore the ‘energy-land-water-health’ complexity. what do you think? (i now enclose my paper for your reference). anyone who reads this reply and who is interested in joining us, please email me at: s.wong@liv.ac.uk.